Nothing smells more like adventure and hidden treasures than the prospect of embarking on a real pirate ship and wander across the seven seas. And if you cannot afford to leave the country at the moment, the developers at Genesis Gaming have you covered. 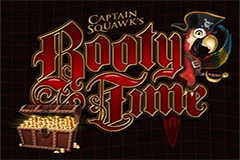 Booty Time is a video slot game designed by the popular studio that revolves entirely around the classic pirate theme, with a few twists to this popular universe. Will you be brave enough to face the many dangers that lurk beneath the surface of the ocean and pocket the jackpot? If you are itching to get the adventure started, read our full review of Booty Time first and you will be fully prepared to tackle any challenge. Being a slot game that revolves around pirates, it should come as no surprise that Booty Time takes place aboard a ship. While the reels take up most of the screen space available, players can still make out plenty of details in the background. From the ropes and flags to the sails, all you are missing if the unmistakable, salty fragrance of the sea and the breeze on your face. No storm on the horizon, Booty Time looks and feels like an exciting game with more than decent graphics and a complete commitment to the universe in which it takes place. Once you have taken command of the ship, it is time to sail away across the horizon and start betting. The game matrix in Booty Time contains 5 reels with three symbols positions on each, and 25 paylines in total. Different cash prizes are associated with symbol combinations, which need to land on activated paylines to trigger such rewards. All combinations pay from left to right on the reels. To adjust your bet settings, head on to the command bar at the bottom of the screen and feel free to modify both the coin value and the size of your wager. Hit spin when you are ready. If you want to focus on the game itself, try the autoplay mode. Simply let the reels spin loose on autopilot for as long as you wish, with constant bet settings throughout. All winnings are added to your credit total automatically as you go, so you will not miss a thing. Remember that big bets mean larger prizes as well, so be bold and always aim for the jackpot. The bet max button lets you go all-in on all paylines with a single click, should you feel in luck. The paytable of Booty Time contains a decent array of 10 different reel symbols, which we can split into two different groups according to their payouts. The first group contains symbols inspired by playing cards, starting with the number 9 and going up to the Ace. Those classic icons were redesigned for the occasion to resemble small, colourful flags. Their rewards might be low, but these little flags are also the most common symbols on the reels of Booty Time. Our ship has the particularity of having the only all-parrot crew of the seven seas, the last symbols of the game mostly represent multi-coloured crew members. The final and most valuable basic icons are a rum bottle, two crew members and the captain himself, wearing the typical black hat. You can expect some juicy rewards with these symbols. Booty Time follows a classic slot game pattern and features two extra special symbols on its reels. For starters, the treasure chest acts as a scatter symbol. No need to worry about the paylines here, all you need to do is make sure that three or more scatters appear on the reels at the same time to trigger an extra cash prize. The Booty Time logo is the wild card here, ready to replace any other symbol on the reels except the scatter. Each combination completed by at least one wild is doubled in value automatically, just to make sure that you have an extra chance to hit a big win. Booty Time makes use of the popular pirate theme and turns the entire crew into parrots. It might sound like a detail, but that might be enough to make the game stand out a little. The gameplay and bonuses available are otherwise very classic, yet efficient. The stakes can be high if you are willing to bet a little extra on every spin, but otherwise Booty Time remains a rather unsurprising slot game.